There is nothing more aggravating than lost parts. 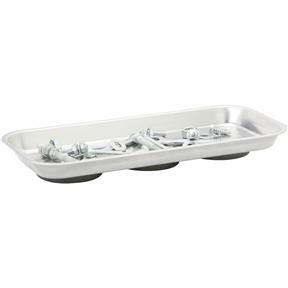 This stainless steel magnetic tray keeps small parts close at-hand and secure anywhere a magnet will stick. Perfect for car repairs and machine tool setups. Im very satisfied with my purchase of a 6 x 14 Stainless Magnetic Parts Tray. It helps in keeping from loosing small parts and fasteners. Needed a long magnetic tray. Sale came at right time, have used it everyday since receiving it. I use this to keep track of the sheet body screws does a great job.